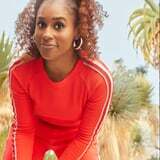 Issa Rae is a pretty busy woman, but with all of the activities packing out her schedule these days (including her upcoming appearance at POPSUGAR Play/Ground this June), the Insecure star still manages to pencil in some time for exercise when she can. In the April issue of Women’s Health, Issa opened up about her fitness journey while talking a bit about how a small weight gain is what lead her to make her body’s health a priority. “When the web series started, I was very, very broke. Then more opportunities began to come. I was gaining ‘new money weight,'” she said. “When you get a new job, you’re like, ‘I can afford to eat at restaurants all the time!’ That adds up in weight.” Issa added that her motivation to get in shape came after watching herself on screen. “Time to work out is so limited, but when I first started seeing myself on TV, I was like, ‘I gotta make time,'” she said. It took a bit of time and effort, but Issa was eventually able to nail down a routine that works for her and her schedule. “I exercise for, like, an hour each day. My neighborhood has a bunch of hills, so it’s walking up hills,” she said. “Then I alternate between walking and jogging. I hate jogging – you’re going in circles, but I recognize that it helps.” Head over to Women’s Health to read Issa Rae’s full interview.